EAG’s chemistry and plant metabolism experts bring extensive experience designing and implementing studies to evaluate the safety, distribution, and metabolism of pesticides and other chemicals in soils and plant tissues. HPLC, Scintillation Counting, GC-MS, and LC-MS are the primary analytical techniques, though other tools and instruments are available if needed. Our scientists deliver unmatched analytical expertise from early phase testing of potential metabolites to identifying the bioaccumulation of chemicals in various matrices. We help clients trace the progression of their chemical and its metabolites through various stages of the plant and into the soil, identifying potential concerns with these chemicals’ safety and distribution. Radiochromatographic profiling: EAG scientists synthesize radiolabeled chemicals and then can trace the profile of the chemical as it is metabolized using radiochromatographic profiling. Chemicals are tracked using scintillation counting and chromatography so that the entire profile of the chemical can be determined. Isolation and identification of metabolites: Our experts develop robust methods to detect and identify all metabolites of a chemical in a variety of matrices, not just plants. These methods can then be transferred or used in subsequent plant metabolism studies. 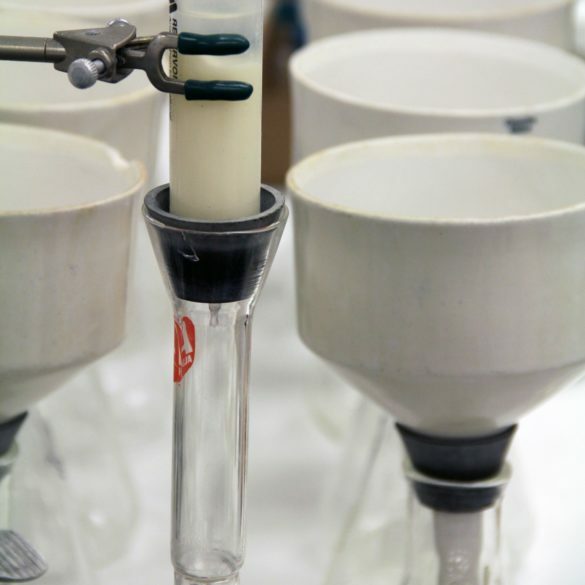 Product chemistry: We further characterize chemicals and their metabolites by testing the stability of the degradants under a variety of storage conditions. Humidity, temperature, water, and hours of light can be controlled for accurate estimates of degradation of chemicals under a variety of conditions.